updated by Charles H. Pickett, Biological Control Program, California Department of Food & Agriculture, Sacramento, CA. 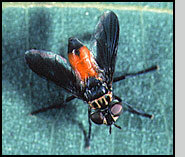 Although several species of tachinid flies have been imported as biological control agents of agricultural pests, this distinctive-appearing parasitoid occurs naturally through much of the United States. Trichopoda pennipes is a parasitoid of several true bugs. 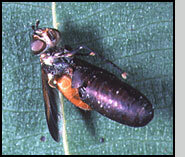 The adult fly is about the size of a house fly and may hover above squash plants in search of prey. It has a bright orange abdomen, velvety black head and thorax, and a fringe of short black hairs on the hind legs. The wings of male flies have a dark spot. The tip of the abdomen of female flies is black. Squash and other crops preyed upon by its key hosts. Primarily squash bug and southern green stinkbug. Although Trichopoda pennipes is a parasitoid of several true bugs, there appear to be different biotypes across the country. Limited field studies suggest that different populations, or perhaps cryptic species, attack different species (types) of true bugs. 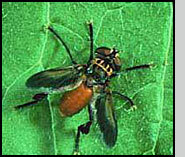 For example, in California, a population of T. pennipes has been reported attacking the bordered plant bug. However the same fly was never found attacking the squash bug. Recently, Trichopoda pennipes were collected from fields of squash in New York and shipped to California where they were released. 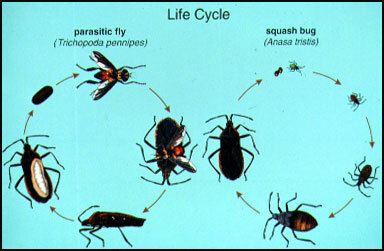 These flies have permanently established populations in northern California near farms growing summer and winter squash. In the past, nymphs of squash bug in this area were never attacked by parasitoids. Now, one can easily find 50% or more of these nymphs with fly eggs deposited on them (see photo). T. pennipes overwinters as a larva in its overwintering host and emerges in late spring or early summer. The female fly lays one to many small, white or gray, oval eggs on large numphs or adult bugs (see photo above). The larvae burrow from the egg directly into the bug's body. Only one larva survives within each pest bug. A large, cream-colored maggot exits from the body of the bug, drops to the ground, and pupates in a dark reddish-brown, capsule-like puparium. The bug soon dies. A new generation of adult flies emerges to lay eggs about two weeks later. Each female fly may lay several hundred eggs, and there may be three generations each year, depending on location. The parasitoid overwinters as a larva within the body of the overwintering bug, emerging in late spring or early summer. Parasitism of squash bugs may be as high as 80%. However, parasitized bugs continue to feed and lay eggs for some time, and the influence of the fly is not always sufficient to prevent economic crop damage. For general information about conservation of natural enemies, see Conservation in the Tutorial section on this site, Feature Article on conservation in Volume II, No. 1 of Midwest Biological Control News. Dietrick, E. J. and R. van den Bosch. (1957) Insectary propagation of the squash bug and its parasite Trichopoda pennipes Fabr. J. Econ. Entomol. 50: 627-629. Hoffmann, M.P. and Frodsham, A.C. (1993) Natural Enemies of Vegetable Insect Pests. Cooperative Extension, Cornell University, Ithaca, NY. 63 pp. Pickett, C. H. Pickett, S. E. Schoenig, and M. P. Hoffmann. 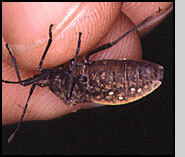 (1996) Establishemnt of the squash bug parasitoid, Trichopoda pennipes Fabr. (Diptera: Tachnidae), in northen California. Pan_Pacific Entomologist 72: 220-226. Location of Trichopoda pennipes eggs on squash bug host. Top: Adult male, Trichopoda pennipes emerging from puparium.